Plastic round reel with silver sticker, slide-type belt clip and reinforced vinyl strap. Black Round Badge Reel with Reinforced Vinyl Strap & Belt Clip. Reel Diameter 1-1/4" (32mm). Sticker Diameter 3/4" ( 19mm). Cord Length 34" (864mm). These badge reels are well-made. We tried switching to cheaper ones but our guys insisted on switching back. 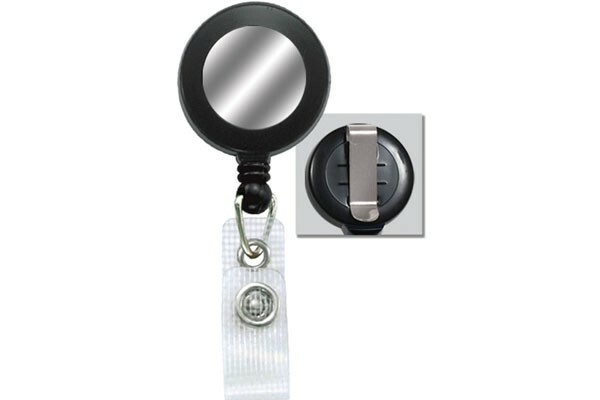 Badge reels are heaven-sent for proximity card users. Make prox cards really easy to swipe. Kinda pricey for what they're good for.